Not to be confused with Columbanus, the Irish missionary monk who founded monasteries in France and Italy. For other uses, see Columba (disambiguation) and Saint Columba (disambiguation). Saint Columba (Irish: Colm Cille, 'church dove';[a] Scots: Columbkille; 7 December 521 – 9 June 597) was an Irish abbot and missionary Evangelist credited with spreading Christianity in what is today Scotland at the start of the Hiberno-Scottish mission. He founded the important abbey on Iona, which became a dominant religious and political institution in the region for centuries. He is the Patron Saint of Derry. He was highly regarded by both the Gaels of Dál Riata and the Picts, and is remembered today as a Catholic saint and one of the Twelve Apostles of Ireland. monk's robes, Celtic tonsure and crosier. Derry, floods, bookbinders, poets, Ireland, Scotland. Colmcille studied under some of Ireland's most prominent church figures and founded several monasteries in the country. 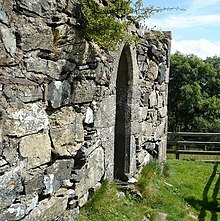 Around 563 he and his twelve companions crossed to Dunaverty near Southend, Argyll, in Kintyre before settling in Iona in Scotland, then part of the Ulster kingdom of Dál Riata, where they founded a new abbey as a base for spreading Celtic Christianity among the northern Pictish kingdoms who were pagan. He remained active in Irish politics, though he spent most of the remainder of his life in Scotland. Three surviving early medieval Latin hymns may be attributed to him. Colmcille was born to Fedlimid and Eithne of the Cenel Conaill in Gartan, a district beside Lough Gartan, in Tír Chonaill (mainly modern County Donegal) in the north of Ireland. On his father's side, he was great-great-grandson of Niall of the Nine Hostages, an Irish high king of the 5th century. He was baptised in Temple-Douglas, in the County Donegal parish of Conwal (midway between Gartan and Letterkenny), by his teacher and foster-uncle Saint Crunathan. It is not known for sure if his name at birth was Colmcille or if he adopted this name later in life; Adomnán (Eunan) of Iona thought it was his birth name but other Irish sources have claimed his name at birth was Crimthann (meaning 'fox'). In the Irish language his name means 'dove', which is the same name as the Prophet Jonah (Jonah in Hebrew is also 'dove'), which Adomnán of Iona as well as other early Irish writers were aware of, although it is not clear if he was deliberately named after Jonah or not. When sufficiently advanced in letters he entered the monastic school of Movilla, at Newtownards, under St. Finnian who had studied at St. Ninian's "Magnum Monasterium" on the shores of Galloway. He was about twenty, and a deacon when, having completed his training at Movilla, he travelled southwards into Leinster, where he became a pupil of an aged bard named Gemman. On leaving him, Colmcille entered the monastery of Clonard, governed at that time by Finnian, noted for sanctity and learning. Here he imbibed the traditions of the Welsh Church, for Finnian had been trained in the schools of St. David. In early Christian Ireland the druidic tradition collapsed due to the spread of the new Christian faith. The study of Latin learning and Christian theology in monasteries flourished. Colmcille became a pupil at the monastic school at Clonard Abbey, situated on the River Boyne in modern County Meath. During the sixth century, some of the most significant names in the history of Celtic Christianity studied at the Clonard monastery. It is said that the average number of scholars under instruction at Clonard was 3,000. Colmcille was one of twelve students of St. Finnian who became known as the Twelve Apostles of Ireland. He became a monk and eventually was ordained a priest. Another preceptor of Colmcille was St. Mobhi, whose monastery at Glasnevin was frequented by such famous men as St. Canice, St. Comgall, and St. Ciarán. A pestilence which devastated Ireland in 544 caused the dispersion of Mobhi's disciples, and Colmcille returned to Ulster, the land of his kindred. He was a striking figure of great stature and powerful build, with a loud, melodious voice which could be heard from one hilltop to another. The following years were marked by the foundation of several important monasteries: Derry, at the southern edge of Inishowen; Durrow, County Offaly; Kells, County Meath; and Swords. While at Derry it is said that he planned a pilgrimage to Rome and Jerusalem, but did not proceed farther than Tours. Thence he brought a copy of those gospels that had lain on the bosom of St. Martin for the space of 100 years. This relic was deposited in Derry. Tradition asserts that, sometime around 560, he became involved in a quarrel with Saint Finnian of Movilla Abbey over a psalter. Colmcille copied the manuscript at the scriptorium under Saint Finnian, intending to keep the copy. Saint Finnian disputed his right to keep the copy. The dispute eventually led to the pitched Battle of Cúl Dreimhne in Cairbre Drom Cliabh (now in County Sligo) in 561, during which many men were killed. 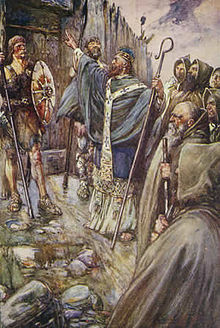 A second grievance that led him to induce the clan Neill to rise and engage in battle against King Diarmait at Cooldrevny in 561 was the king's violation of the right of sanctuary belonging to Colmcille's person as a monk on the occasion of the murder of Prince Curnan, the saint's kinsman. Prince Curnan of Connaught, who had fatally injured a rival in a hurling match and had taken refuge with Colmcille, was dragged from his protector's arms and slain by Diarmaid's men, in defiance of the rights of sanctuary. A synod of clerics and scholars threatened to excommunicate him for these deaths, but St. Brendan of Birr spoke on his behalf with the result that he was allowed to go into exile instead. Colmcille's own conscience was uneasy, and on the advice of an aged hermit, Molaise, he resolved to expiate his offence by going into exile and win for Christ as many souls as had perished in the terrible battle of Cúl Dreimhne. He left Ireland, to return only once, many years later. Colmcille's copy of the psalter has been traditionally associated with the Cathach of St. Colmcille. In 563, he travelled to Scotland with twelve companions (said to include Odran of Iona) in a wicker currach covered with leather. According to legend he first landed on the Kintyre Peninsula, near Southend. However, being still in sight of his native land, he moved farther north up the west coast of Scotland. The island of Iona was made over to him by his kinsman Conall mac Comgaill King of Dál Riata, who perhaps had invited him to come to Scotland in the first place. However, there is a sense in which he was not leaving his native people, as the Ulster Gaels had been colonising the west coast of Scotland for the previous couple of centuries. Aside from the services he provided guiding the only centre of literacy in the region, his reputation as a holy man led to his role as a diplomat among the tribes. There are also many stories of miracles which he performed during his work to convert the Picts, the most famous being his encounter with an unidentified animal that some have equated with the Loch Ness Monster in 565. It is said that he banished a ferocious "water beast" to the depths of the River Ness after it had killed a Pict and then tried to attack Colmcille's disciple named Lugne (see Vita Columbae Book 2 below). He visited the pagan King Bridei, King of Fortriu, at his base in Inverness, winning Bridei's respect, although not his conversion. He subsequently played a major role in the politics of the country. He was also very energetic in his work as a missionary, and, in addition to founding several churches in the Hebrides, he worked to turn his monastery at Iona into a school for missionaries. He was a renowned man of letters, having written several hymns and being credited with having transcribed 300 books. One of the few, if not the only, times he left Scotland was towards the end of his life, when he returned to Ireland to found the monastery at Durrow. Colmcille died on Iona and was buried in 597 by his monks in the abbey he created. In 794 the Vikings descended on Iona. Colmcille's relics were finally removed in 849 and divided between Scotland and Ireland. The parts of the relics which went to Ireland are reputed to be buried in Downpatrick, County Down, with St. Patrick and St. Brigid or at Saul Church neighbouring Downpatrick. (Names of Iona), Inchcolm and Eilean Chaluim Chille. Saint Colmcille is one of the three patron saints of Ireland, after Saint Patrick and Saint Brigid of Kildare. Colmcille is the patron-saint of the city of Derry, where he founded a monastic settlement in c. 540. The name of the city in Irish is Doire Colmcille and is derived from the native oak trees in the area and the city's association with Colmcille. The Catholic Church of Saint Colmcille's Long Tower, and the Church of Ireland St Augustine's Church both claim to stand at the spot of this original settlement. The Church of Ireland Cathedral in Derry is dedicated to St Colmcille. St. Columba's Primary School in Drumcondra is a girl's school named after the saint. St. Colmcilles Primary School and St. Colmcilles Community School are two schools in Knocklyon, Dublin, named after St. Colmcille, with the former having an annual day dedicated to the saint on 9 June. The town of Swords, Dublin was reputedly founded by Saint Colmcille in 560 AD. St Colmcille’s Boys’ National School and St. Colmcille’s Girls’ National School, both located in the town of Swords, are also named after the saint. The Columba Press, a religious and spiritual book company based in Dublin, is named after St. Colmcille. Aer Lingus, Ireland's national flag carrier has named one of its Airbus A330 aircraft in commemoration of the saint (reg: EI-DUO). Colmcille is credited as being a leading figure in the revitalisation of monasticism. The Clan Malcolm/Clan McCallum claims its name from Colmcille and was reputedly founded by the descendants of his original followers. It is also said that Clan Robertson Clan Donnachaidh / Duncan are heirs of Colmcille. Clan MacKinnon may also have some claim to being spiritual descendants of St Colmcille as after he founded his monastery on Isle Iona, the MacKinnons were the abbots of the Church for centuries. This would also account for the fact that Clan MacKinnon is amongst the ancient clans of Scotland. The cathedral of the Catholic Diocese of Argyll and the Isles is placed under the patronage of St. Colmcille, as are numerous Catholic schools and parishes throughout the nation. The Scottish Episcopal Church, the Church of Scotland, and the Evangelical Lutheran Church of England also have parishes dedicated to him. The village of Kilmacolm in Renfrewshire is also derived from Colmcille's name. St Columba's Hospice, a prominent hospice in Edinburgh, is named after the saint. Saint Colmcille currently has two poems attributed to him: "Adiutor Laborantium" and "Altus Prosator". Both poems are examples of Abecedarian hymns in Latin written while Colmcille was at the Iona Abbey. The shorter of the two poems, "Adiutor Laborantium" consists of twenty-seven lines of eight syllables each, with each line following the format of an Abecedarian hymn using the Classical Latin alphabet save for lines 10-11 and 25-27. The content of the poem addresses God as a helper, ruler, guard, defender and lifter for those who are good and an enemy of sinners whom he will punish. "Altus Prosator" consists of twenty-three stanzas sixteen syllables long, with the first containing seven lines and six lines in each subsequent stanza. It uses the same format and alphabet as "Adiutor Laborantium" except with each stanza starting with a different letter rather than each line. The poem tells a story over three parts split into the beginning of time, history of Creation, and the Apocalypse or end of time. As of 2011, Canadians who are of Scottish ancestry are the third largest ethnic group in the country and thus Columba's name is to be found attached to Catholic, Anglican and Presbyterian parishes. This is particularly the case in eastern Canada, apart from French-speaking Quebec . Throughout the US there are numerous parishes within the Catholic and Episcopalian denominations dedicated to Colmcille. Within the Protestant tradition the Presbyterian Church (which has its roots in Scottish Presbyterianism) also has parishes named in honour of Colmcille. There is even an Orthodox Church monastery dedicated to the saint in the Massachusetts town of Southbridge. St. Colmcille is the Patron Saint of the Roman Catholic Diocese of Youngstown, OH. The Cathedral there is named for him. Iona College, a small Catholic liberal arts college in New Rochelle, NY, is named after the island on which Colmcille established his first monastery in Scotland, as is Iona College in Windsor, Ontario, Iona Presentation College, Perth and Iona College Geelong. There are at least four pipe bands named for him; one each from Tullamore, Ireland, from Derry, Northern Ireland, from Kearny, New Jersey, and from Cape Cod, Massachusetts. St. Columba's School one of the most prominent English-Medium schools in India run by the Irish Christian Brothers is also named after the Saint. The Munich GAA is named München Colmcilles. St. Colmcille's Feast Day, 9 June, has been designated as International Celtic Art Day. The Book of Kells and the Book of Durrow, great medieval masterpieces of Celtic art, are associated with Colmcille. The main source of information about Saint Colmcille's life is the Vita Columbae (i.e. "Life of Colmcille"), a hagiography written in the style of "saint's lives" narratives that had become widespread throughout medieval Europe. Compiled and drafted by scribes and clergymen, these accounts were written in Latin and served as written collections of the deeds and miracles attributed to the saint, both during his or her life or after death. The canonization of a saint, especially one who had lived on the fringes of the medieval Christian world like Saint Colmcille, required a well-written hagiography to be submitted to Rome, but popular belief and local cults of sainthood often led to the veneration of these men and women without official approval from the Church. Writing a century after the death of Saint Colmcille, the author Adomnán (also known as Eunan), served as the ninth Abbot of Iona until his death in 704. James Earle Fraser asserts that Adomnán drew extensively from an existing body of accounts regarding the life of Saint Colmcille, including a Latin collection entitled "De uirtutibus sancti Columbae", composed c. 640 A.D. This earlier work is attributed to Cummene Find, who became the abbot of Iona and served as the leader of the monastic island community from 656 until his death in 668 A.D. or 669 A.D.
B1 British Library MS Add. 35110 (B1), folios 96v-143r, probably written before 1165. B2 British Library MS Cottonian Tiberius D III (B2), folios 192r-217r, written end of 12th to early 13th century. Due to fire damage in 1731, there are missing illegible portions on every page, and six folios [Book I, ch. 2 (diebus) to 22 (genibus) and 36 (viro) to 49 (omnia quae)] are missing completely. B3 British Library MS Royal 8 D IX (B3), folios 1r-70r, written in the fifteenth or early sixteenth century. The first 8 folios, [to I, 3 (haec puro pectore)] are missing. Instead of relying on chronological order, Adomnán categorises the events recorded in the Vita Columbae into three different books: Columba’s Prophecies, Columba’s Miracles, and Columba’s Apparitions. In the first book, the author Adomnán lists Saint Colmcille's prophetic revelations, which come as a result of the saint's ability to view the present and the future simultaneously. Most of the short chapters begin with Saint Colmcille informing his fellow monks that a person will soon arrive on the island or an event will imminently occur. In one notable instance, Colmcille appears in a dream to King Oswald of Northumbria, and announces the king's incoming victory against the King Catlon (Cadwallon of Wales) in the Battle of Heavenfield. The people of Britain promise to convert to Christianity and receive baptism after the conclusion of the war. This victory signals the re-Christianizing of pagan England, and establishes King Oswald as ruler of the entirety of Britain. Colmcille's other prophecies include when he sends a man named Batain off to perform his penance, but then Colmcille turns to his friends and says Batain will instead return to Scotia and be killed by his enemies. Several of Saint Colmcille's prophecies reflect the scribal culture in which he was immersed, such his miraculous knowledge of the missing letter "I” from Baithene's psalter or when he prophecies that an eager man will knock over his inkhorn and spill its contents. In the second book, Colmcille performs various miracles such as healing people with diseases, expelling malignant spirits, subduing wild beasts, calming storms, and even returning the dead to life. He also performs agricultural miracles that would hold a special significance to the common people of Ireland and the Britain such as when he casts a demon out of a pail and restores the spilt milk to its container. The Vita contains a story that has been interpreted as the first reference to the Loch Ness Monster. According to Adomnán, Colmcille came across a group of Picts burying a man who had been killed by the monster. Colmcille saves a swimmer from the monster with the sign of the Cross and the imprecation, "Thou shalt go no further, nor touch the man; go back with all speed." The beast flees, terrified, to the amazement of the assembled Picts who glorified Colmcille's God. Whether or not this incident is true, Adomnan's text specifically states that the monster was swimming in the River Ness – the river flowing from the loch – rather than in Loch Ness itself. In book three, Adomnán describes different apparitions of the Saint, both that Colmcille receives and those that are seen by others regarding him. He mentions that, "For indeed after the lapse of many years, ... St. Colmcille was excommunicated by a certain synod for some pardonable and very trifling reasons, and indeed unjustly" (P.79- 80). In one of the accounts, Saint Colmcille, in this period of excommunication, goes to a meeting held against him in Teilte. Saint Brendán, despite of all the negative reactions among the seniors toward Colmcille, kisses him reverently and assures that Colmcille is the man of God and that he sees Holy Angels accompanying Colmcille on his journey through the plain. And having given them his holy benediction in this way, he immediately breathed his last. After his soul had left the tabernacle of the body, his face still continued ruddy, and brightened in a wonderful way by his vision of the angels, and that to such a degree that he had the appearance, not so much of one dead, as of one alive and sleeping. Both the Vita Columbae and the Venerable Bede (672/673-735) record Colmcille's visit to Bridei. Whereas Adomnán just tells us that Colmcille visited Bridei, Bede relates a later, perhaps Pictish tradition, whereby the saint actually converts the Pictish king. Another early source is a poem in praise of Colmcille, most probably commissioned by Colmcille's kinsman, the King of the Uí Néill clan. It was almost certainly written within three or four years of Colmcille's death and is the earliest vernacular poem in European history. It consists of 25 stanzas of four verses of seven syllables each, called the Amra Coluim Chille. Through the reputation of its venerable founder and its position as a major European centre of learning, Colmcille's Iona became a place of pilgrimage. Colmcille is historically revered as a warrior saint, and was often invoked for victory in battle. His relics were finally removed in 849 and divided between Alba and Ireland. Relics of Colmcille were carried before Scottish armies in the reliquary made at Iona in the mid-8th century, called the Brecbennoch. Legend has it that the Brecbennoch was carried to the Battle of Bannockburn (24 June 1314) by the vastly outnumbered Scots army and the intercession of Colmcille helped them to victory. Since the 19th century the "Brecbennoch of St. Columba" has been identified with the Monymusk Reliquary, although this is now doubted by scholars. In the Antiphoner of Inchcolm Abbey, the "Iona of the East" (situated on an island in the Firth of Forth), a 14th-century prayer begins O Columba spes Scotorum... "O Columbus, hope of the Scots". ^ Other names include Irish Gaelic Chille, Scots Gaelic Calum Cille, Manx Gaelic Colum Keeilley, and Old Norse Kolban or Kolbjørn. ^ Kenyon, Sherrilyn (2005), The Writer's Digest character naming sourcebook, Writer's Digest Books, p. 358 . ^ Father Colgan 1844, p. 11. Gratton-Flood, W.H. (1913). "The Twelve Apostles of Erin". In Herbermann, Charles (ed.). Catholic Encyclopedia. New York: Robert Appleton Company. ^ Charles-Edwards 2000, p. 303. Quiggin, Edmund Crosby (1911). "Columba, Saint" . In Chisholm, Hugh (ed.). Encyclopædia Britannica. 6 (11th ed.). Cambridge University Press. p. 737. ^ Reeves 1850, p. 82. ^ Ordnance Survey Memoirs for the Parishes of Desertmartin and Kilcronaghan, Ballinascreen Historical Society, 1986 . ^ Adomnan of Iona 1995. Edmonds, Columba (1913). "St. Columba". In Herbermann, Charles (ed.). Catholic Encyclopedia. New York: Robert Appleton Company. ^ a b c Crawley, John J (1954). "Saint Columba, Abbot and Confessor—521-597". Lives of the Saints. John J. Crawley & Co – via EWTN. ^ Sidwell 1995, p. 70. ^ Fletcher 1989, pp. 23-24. ^ "Who is St. Columba?" St. Columba Retreat House. Retrieved 6 October 2008. ^ "Scotland's History – Columba". BBC. 1 January 1970. Retrieved 17 August 2012. ^ "St Colmcilles". Retrieved 12 May 2014. ^ "St. Colmcille's Community School". 8 May 2014. Retrieved 12 May 2014. ^ "St. Colmcille's Girls' N.S. - Fáilte chuig suíomh idirlíon Scoil Cholmcille na gCailíní". stcolmcillesgns.scoilnet.ie. ^ "St Columba's Hospice, Palliative Care in Edinburgh,". www.stcolumbashospice.org.uk. ^ Moore, T.M. (23 August 2014). "Helper of Workers". The Fellowship of Ailbe. Retrieved 10 June 2018. ^ Clancy & Gilbert 1995, p. 73. ^ Wesseling, Margaret (1988). "Structure and Image in the "Altus Prosator": Columba's Symmetrical Universe". Proceedings of the Harvard Celtic Colloquium. 8: 46–57. JSTOR 20557197. ^ "colmcillepipeband.com". colmcillepipeband.com. Retrieved 12 May 2014. ^ "stcolumcille.com". stcolumcille.com. Retrieved 12 May 2014. ^ "capecodpipesanddrums.com". capecodpipesanddrums.com. Retrieved 12 May 2014. ^ "munichgaa.de". munichgaa.de. Retrieved 12 May 2014. Gratton-Flood, W.H. (1913). "St. Adamnan". In Herbermann, Charles (ed.). Catholic Encyclopedia. New York: Robert Appleton Company. ^ Fraser 2009, p. 98. ^ a b "Life of St. Columba". Ucc.ie. Retrieved 17 August 2012. ^ Adomnan of Iona 1995, Book one, Chapter 17. ^ Adomnan of Iona 1995, Book two, Chapter 28. ^ Adomnan of Iona 1995, Book three, Chapter 3. ^ Adomnan of Iona 1995, Book three, Chapter 23. ^ History, Scottish; read, Archaeology 5 min. "Monymusk reliquary". National Museums Scotland. ^ Gillespie 2016, p. 133. Reeves, William (1850). Acts of Archbishop Colton in His Metropolitan Visitation of the Diocese of Derry, A.D. 1397; With a Rental of the See Estates at that Time; Edited, from the Original Roll Preserved in the Archiepiscopal Record Closet of Armagh. Irish Archaeological Society. Father Colgan (1844). The Saintly Triad, Or The Lives of St. Patrick, St. Columbkille, and St. Bridget. Dublin. Charles-Edwards, T. M. (2000). Early Christian Ireland. Cambridge University Press. ISBN 978-0-521-36395-2. Wagner, Paul; Konstam, Angus (2012). Pictish Warrior AD 297-841. Bloomsbury Publishing. ISBN 978-1-78200-216-1. Munn, Alfred Moore (1985). Notes on the Place Names of the Parishes and Townlands of the County of Londonderry. Ballinascreen Historical Society. Adomnan of Iona (1995). Life of St Columba. Penguin Books. ISBN 978-0-14-190741-3. Sidwell, Keith (1995). Reading Medieval Latin. Cambridge University Press. ISBN 978-0-521-44747-8. Fletcher, Richard A. (1989). Who's who in Roman Britain and Anglo-Saxon England. Shepheard-Walwyn. ISBN 978-0-85683-089-1. Fraser, James Earle (2009). From Caledonia to Pictland: Scotland to 795. Edinburgh University Press. ISBN 978-0-7486-1232-1. Dowley, Tim, ed. (1977). Eerdman's handbook to the history of Christianity. Eerdmans. ISBN 978-0-8028-3450-8. Clancy, Thomas Owen; Gilbert, Márkus (1995). Iona: The earliest poetry of a Celtic monastery. Edinburgh University Press. ISBN 978-0748605316. Gillespie, Donald S. (2016). Lochaber Lights. Holy Fire Publishing. ISBN 9781603835121. Bullough, Donald A. "Columba, Adomnan, and the Achievement of Iona," Scottish Historical Review 43, 44 (1964–65): 111–30, 17–33. Finlay, Ian, Columba London: Gollancz, 1979. Healy, John (1892). "Saint Columba" . The ancient Irish church (1 ed.). London: Religious Tract Society. pp. 52–69. Wikimedia Commons has media related to Columba. "St. Columba". Catholic Encyclopedia. 1913.